The ultimate guide and companion for anyone who wants to record the story of his or her life or that of a loved one. Have you ever wondered about an ancestor you know only as a compelling face in a faded family photograph? Imagine discovering an entire book on this ancestor's life -one that described the world in which he lived and detailed his dreams, accomplishments, disappointments, and the accumulated wisdom of a lifetime. The Legacy Guide helps readers create such a book. Designed for writers and non-writers alike, it outlines a simple, intuitive, and highly flexible framework for turning your personal history-or that of a loved one-into a treasured family heirloom. It's been said that everyone has a story to tell, but anyone who has sat down to record his or her life story will tell you that there were moments of feeling completely overwhelmed and frustrated. 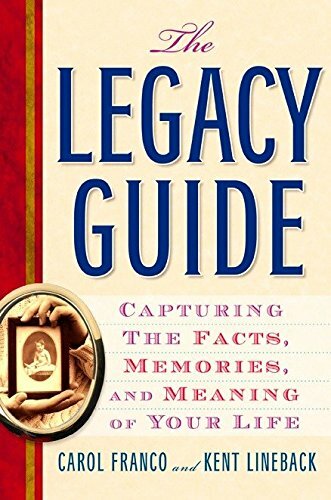 Introducing the innovative program Facts to Memories to Meaning, The Legacy Guide takes you step-by-step through the seven stages of life-such as childhood, adolescence, young adulthood, etc.-to recall moments long forgotten and to discover their significance. And it helps you fashion these pieces together, much as you would a scrapbook, into a creative and compelling whole. Full of engaging and instructive quotations from the famous and the not-so-famous who have committed their stories to paper, The Legacy Guide will inspire you to capture the milestone events that have given shape to your life and allow you to weave them into a book that preserves this legacy for generations to come. If you have any questions about this product by TarcherPerigee, contact us by completing and submitting the form below. If you are looking for a specif part number, please include it with your message.